And a come-from-behind 2-1 win over Fiorentina was enough to give them a 20-point lead on nearest rivals Napoli with five games to play. But Alex Sandro's diving header on 37 minutes and an own goal from Fiorentina defender German Pezzella after a Ronaldo cross in the 53rd minute sealed another title to ease their European disappointment. It was the 34-year-old's sixth domestic league title, having won three with Manchester United and two with Real Madrid. Bolstered by five-time Ballon d'Or winner Ronaldo, Juventus dominated the domestic league with the best attack and defence. Ronaldo threatened early, but defender Milenkovic gave Fiorentina hope of a first win in eight trips to the Allianz Stadium. WASHINGTON: The US Federal Aviation Administration is planning what it calls a comprehensive multi-nation review of the control systems of the Boeing 737 Max airliner to include experts from nine civil aviation authorities. The US Federal Aviation Administration is planning what it calls a comprehensive multi-nation review of the control systems of the Boeing 737 Max airliner to include experts from nine civil aviation authorities; the review should take 90 days. The new review will be chaired by Chris Hart, a former head of the US National Transportation Safety Board, and will include experts from the FAA and NASA. In addition, civil aviation authorities from these countries will take part: Australia, Brazil, Canada, China, the European Union, Japan, Indonesia, Singapore and the United Arab Emirates. 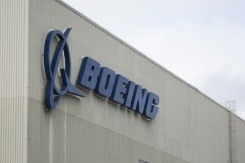 Boeing CEO Dennis Muilenburg, who was on board one recent test flight, vowed to make the 737 Max "one of the safest airplanes ever to fly." Fabio FogniniThe shock result leaves Italian 13th seed Fognini facing unseeded Serb Dusan Lajovic in Sunday's unscripted final. "I played one of my worst matches on clay in 14 years," said Nadal. Fognini, who beat Nadal twice on clay in 2015, stopped a 25-set win streak in the principality for the world number two. For 31-year-old Fognini, based just over the border in San Remo, it was a fourth career win over Nadal and third on clay. "I've beaten Rafa on clay, I'm really happy, it was windy and tough to play. Demonstrators were continuing to block Waterloo Bridge in the city and the central Oxford Circus junction despite the removal by police of the pink sailing boat which had acted as a natural focal point for the movement. Some 28 people have been charged in relation to the protests, which have caused disruption for commuters in the British capital. Campaigners want governments to declare a climate and ecological emergency, reduce greenhouse gas emissions to zero by 2025, halt biodiversity loss and be led by new "citizens' assemblies on climate and ecological justice". "One thing that is unusual about this demonstration is the willingness of those participating to be arrested and also their lack of resistance to the arrests." The large number of arrests has created a "logistical problem" for the police in terms of cell space and also the "wider criminal justice system". 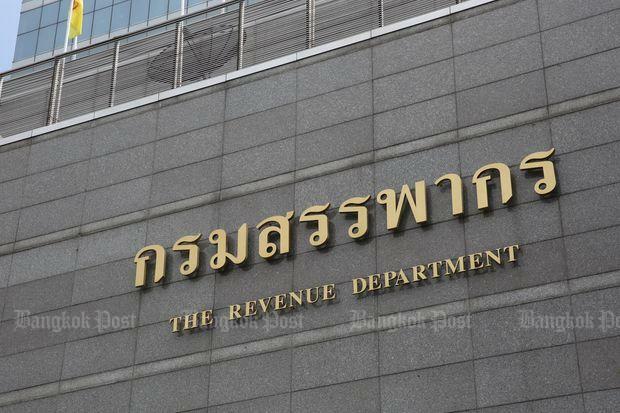 (Bangkok Post file photo)The Revenue Department has clarified its new regulation on interest income tax to dispel public misunderstanding that earners will have to pay the tax from the first baht. At present, interest income from fixed deposits is subject to 15% withholding tax but the first 20,000 baht of the income is exempted. The department issued an announcement on Friday on the new criteria for the interest income tax exemption. Since banks have no knowledge of the interest income of an individual at other banks, the strategy worked, prompting the Revenue Department to plug the loophole. Writing on Facebook, he said the Revenue Department should coordinate with the Bank of Thailand, which has access to bank information. 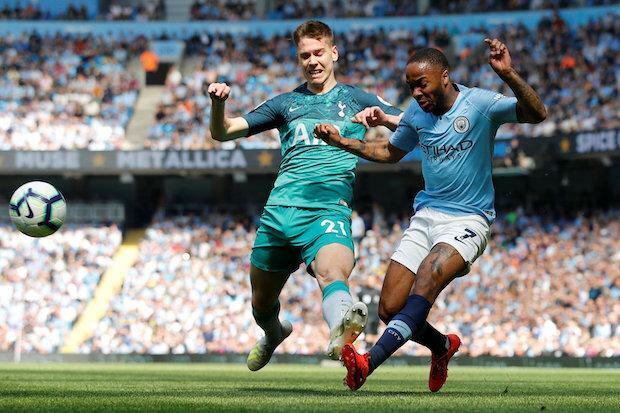 MANCHESTER: Manchester City returned to the top of the Premier League with a fifth-minute Phil Foden goal giving them a nervy 1-0 win over Tottenham Hotspur at the Etihad stadium on Saturday. But City’s 10th Premier League win in a row came at a price with key midfielder Kevin De Bruyne forced off with what looked like another knee injury in the 38th minute. Son Heung-min, who had scored a brace in the opening minutes in the Champions League, twice threatened the City goal but both times City keeper Ederson was out quickly to nullify the danger. City were in charge but too often their attacks broke down on the edge of the area with Spurs quick to get deep in numbers. The pressure was being felt, with Spurs also in need of points in their bid for a top-four finish and Champions League football next season. Police headquarters reported 126 arrests and 11,000 checks on individual protesters. Paris seemed to bear the brunt of Saturday's protests, but other French cities were also expecting demonstrations. Earlier this month, French President Emmanuel Macron signed into law legislation that gave security forces greater powers at demonstrations but which opponents claimed violated civil liberties. It would also have given the authorities the power to ban from demonstrations any individual "posing a particularly serious threat to public order". The "yellow vest" movement is demanding changes to the government's social and fiscal policies. 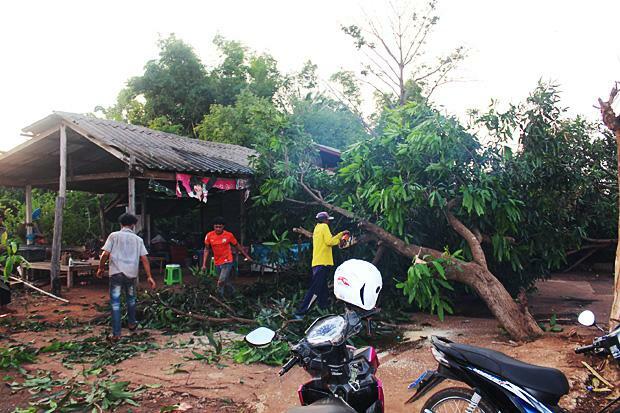 (Photo supplied by Wassayos Ngamkham)A man who allegedly swindled farmers in the North out of 10 million baht in a date palm seedlings scam has been arrested in Maha Sarakham province after six years on the run. 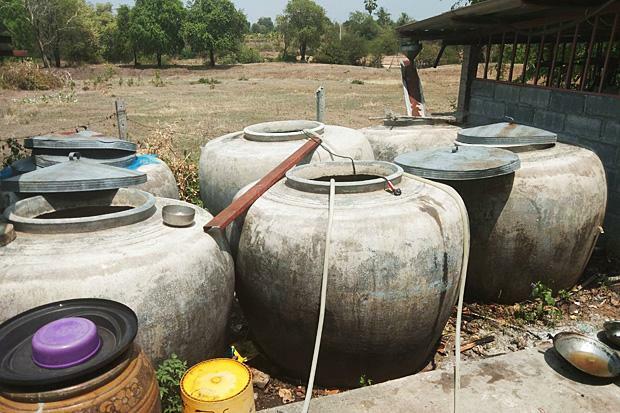 The complainants said Mr Veerasak, claiming to be a staff member of a tree-planting firm in the North, had persuaded them to grow date palm seedlings for exports. To help them get started, he sold date palm seeds to the farmers at 30 baht each and promised to buy the seedlings from them at 60 baht each. After the farmers grew the date palm seedlings, the firm the suspect claimed to work for refused to buy them. CSD investigators began the investigation and later found he had been hiding in Chiang Yuen district of Maha Sarakham province. 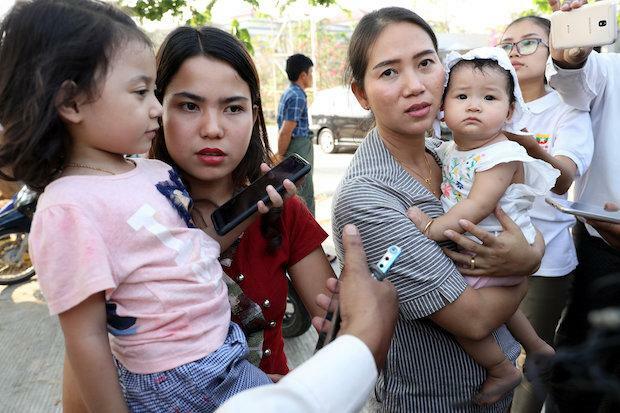 Pan Ei Mon (left) and Chit Su Win, the wives of jailed Reuters reporters Wa Lone and Kyaw Soe Oo, talk to reporters after attending a hearing at the Supreme Court in Nay Pyi Taw in January. (Reuters Photo)YANGON: Myanmar’s Supreme Court will deliver its ruling on Tuesday on the appeal of two Reuters journalists imprisoned for breaking a colonial-era official secrets law, the court said on Saturday. “We have done our best in appealing to the Supreme Court. We hope the court will decide to release Wa Lone and Kyaw Soe Oo,” he said. The pair also were among the journalists chosen by Time magazine as its persons of the year for 2018. 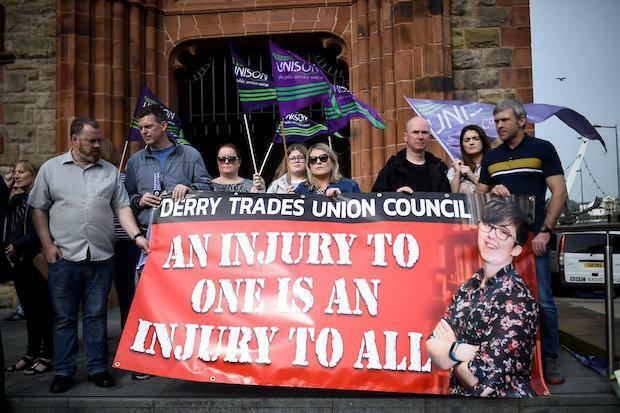 People attend a vigil at the Guildhall in Londonderry, Northern Ireland, for 29-year-old journalist Lyra McKee who was shot dead during a riot on Thursday night. (Reuters Photo)LONDON: Police in Northern Ireland on Saturday arrested two young men in connection with the fatal shooting of a journalist during rioting in the city of Londonderry. The pair, aged 18 and 19, were detained under anti-terrorism legislation and taken to Belfast for questioning, the Police Service of Northern Ireland said. The use of a firearm apparently aimed at police marks a dangerous escalation in sporadic violence that continues to plague Northern Ireland 21 years after the Good Friday accord was signed. Some politicians believe uncertainty over Brexit and the possible reintroduction of a “hard border” between Northern Ireland and the Republic of Ireland are stoking tensions in the region. Ukrainian comedian and presidential candidate Volodymyr Zelensky makes the V for victory sign during a presidential election debate with incumbent Petro Poroshenko. Others said they doubted the political novice's ability to enact real change as post-Soviet Ukraine's sixth president. 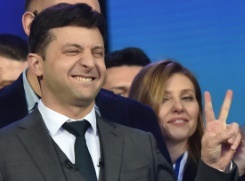 A survey by the Rating pollster released on Thursday showed Zelensky winning 73 percent of the vote against 27 percent for Poroshenko. Ukrainians said the head-to-head was more about political theatrics and a battle of wits than a much-needed policy debate. He also drew attention to Zelensky's close ties to controversial tycoon Igor Kolomoysky whose TV channel broadcasts the comedian's shows. Toshiko Sekino holds her baby Ryusuke, who weighed just 258 grammes when he was born five months ago, as family members look on following his discharge from a hospital in Azumino, Nagano Prefecture on Saturday. “After going home, I want the baby’s brothers and sister to hold him in their arms,” mother Toshiko Sekino said. As of Friday, Ryusuke Sekino weighed 3.37 kilogrammes, according to the Nagano Children’s Hospital. “I was not expecting to be able to see him outside the hospital this quickly,” said his beaming father, Kohei Sekino. Toshiko Sekino told reporters she was worried and cried a lot at first because her baby was so fragile and had transparent skin. 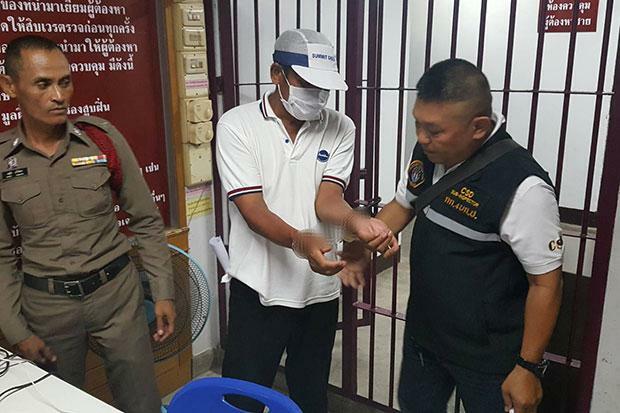 Police and soldiers examine packages containing speed pills and crystal methamphetamine seized from three men following a car chase in Khemarat district of Ubon Ratchathani earlier on Saturday. (Photo from @ubonnewsagency Facebook page)UBON RATCHATHANI: Three men are in custody after authorities seized 250,000 speed pills and some crystal methamphetamine following a car chase early Saturday. The trio were identified as Mongkhol Kaewthongdee, 40; Itthiphon Sarnthor, 20; and Apichai Saiseeda, 29, all from Ubon Ratchathani. Seized from the car were 258,000 speed pills and 1.2 kilograms of crystal methamphetamine. 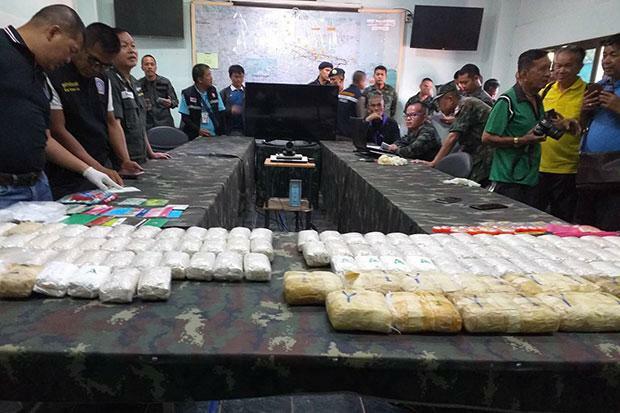 Pol Col Sanit Chaiyasathit, investigation chief of Ubon Ratchathani police, said the suspects confessed to having smuggled the drugs from a neigbhouring country. "Today, in the early hours of the morning, a very sensitive and important operation was conducted with the help of the United States in which the Kosovar government repatriated 110 citizens from the war zone in Syria," justice minister Abelard Tahiri told a news conference. The group was made up mostly of women and children, but there were also four fighters, he said. Some 300 Kosovars joined jihadists in Syria and Iraq, according to the interior ministry. Around 70 of them were killed and 120 have come home, with most arrested on their return. Kosovo passed a law four years ago allowing citizens to be jailed for up to 15 years if they leave the country to join armed groups abroad.